The first child of Nat Gould and his wife Elizabeth Madeline Ruska was a daughter Edith Mary Gould. She was born on 28 November 1886 at Brisbane in Australia, but sadly she died on 28 February 1887. Nat Gould nowhere mentioned her in his autobiographical writings. His mother Mary Gould knew about her, which indicates that there was correspondence between Nat Gould in Australia and his mother in England. This appears however to be no longer extant. Edith Mary Gould died in Australia before her grandmother ever saw her, as Nat Gould and his family did not arrived in England until 1895. 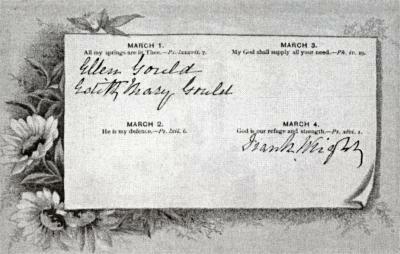 Mary Gould entered her date of her birth in her Birthday Book, but on the wrong day (1 March). She had started entering birthdays in the book in 1887, presumably just before her granddaughter died in Australia.